There are a few necessary steps to make sure your plot files are extremely accurate. You will need PMU version 4.0.758 or higher for the following procedure. For version history, see the changelog. Close one eye, and align your field of view such that the back screws on the bottom of the cutter plate are centered in the middle of the front screws. now use page up/page down until the alignment marks on the cutter plate align with the steel blade holder mount. Your X/Y cutter offset must be set properly before proceeding. For instructions on this procedure, please see your manual. Now you will fine-tune the blade alignment. You will need to do this each time you turn your machine on. This should not take more than 5 minutes. Download our calibration test file, and save it in your nest directory. Be sure your pen and cutter are both enabled in the plot tab. 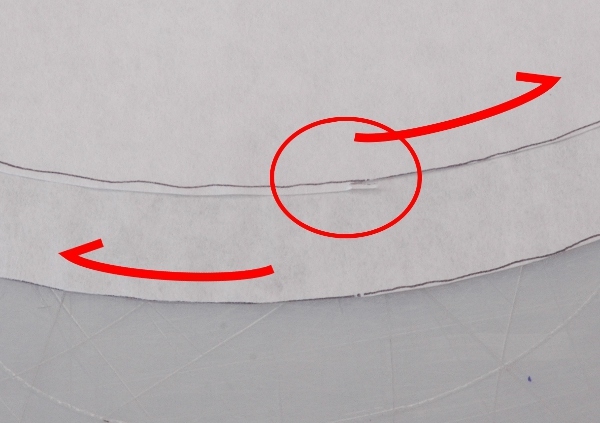 Pull out paper, secure it, and run the calibration pattern. The pattern is about 22×10 inches and will plot, then cut 2 circles. The lower circle will plot/cut Clockwise (CW) and the upper circle will plot/cut Counter Clockwise (CCW). The goal is for the upper and lower circles to match. They may not cut exactly on their plot line and may not match at their start/stop — THE IMPORTANT POINT is they match each other. You will likely notice that one circle follows the line very closely, and the other does not quite meet up back where it started. In this example, the circle that cut in a clockwise direction cut almost perfectly, but the one that cut counter-clockwise did not. You will rotate the blade holder in the direction of the less accurate circle. In this case you will want to move your cutter counter-clockwise. Page Up turns the blade holder CCW and Page Down turns the cutter CW. Here you would hit the page-up button 1 to 4 times, depending how much it’s off. In this case, 2 taps of the page-up button did the trick. You should now repeat this test. If successful, the 2 circles should look about the same. Again, it’s not important that each circle is perfect, only that they are both the same. If they do not look the same, you should repeat the test until they do. It may take several attempts until you get the hang of it. Each test takes around a minute. 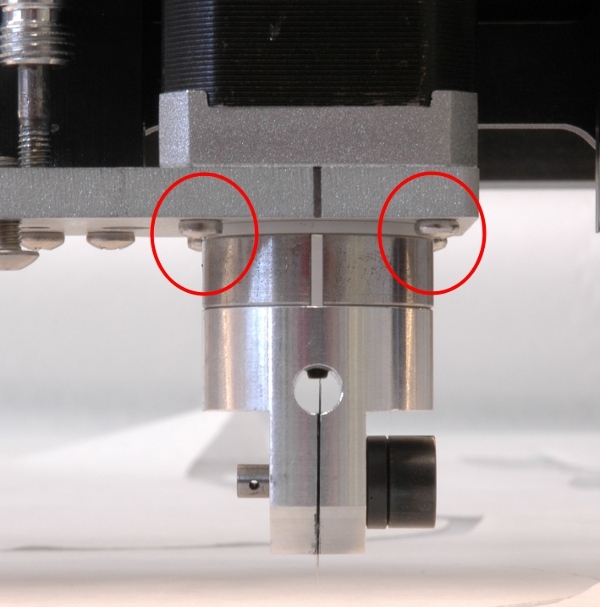 Now you should adjust your software settings for high-accuracy cutting. Adjust the text box to the left of the Steering slider to be 0.5 or lower. Lower values will give you marginally more accuracy at the cost of slower plot speed. We have found that a value of 0.5 yields +/-1/64″ or better in most cases and +/-1/32″ in all tested patterns*. The text box will override the setting specified by the slider. To restore steering control to the slider, simply delete the number from the text box. You should now be ready to perform high-precision cuts with your plotter. *If you would like us to test a specific pattern, please email us your file toservice@carlsondesign.com.